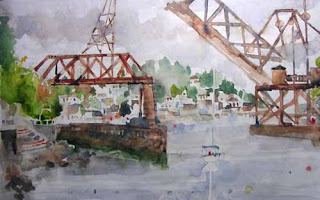 Rains, trains and running coho — thoroughly enjoyed my first outing with the Seattle UrbanSketchers. Not sure I've ever been here without out-of-towners in tow. I didn't even know that the train bridge really does go up and down with some frequency. I first sketched it down, but liked it better up, to let in the view. Great watercolor. Love how you captured the depth with the atmospheric perspective. Wish I could have been there. i love the colors. their vibrancy shows through, without losing the sense of it being a misty grey day.